Mexican-born violinist Anabel Ramirez began studying the violin at age six in her native country with Russian violinist Gari Petrenko. By 1991 she had twice won the National Violin Competition in Mexico and the following year Ms. Ramirez was awarded a full scholarship to study at the Ollin Yoliztly School of the Arts in Mexico City. Under the tutelage of Natalya Gbodetskaya, she won the 'Carlos Chavez' competition in 1992. At age 16, she came to the US to study at the University of Houston under the sponsorship of the Starling Foundation Scholarship Fund, where she completed her Bachelor's of Music Performance under the supervision of Fredell Lack. She subsequently completed her Masters Degree at the University of British Columbia, having studied with Andrew Dawes. Returning to the US in 2004, she began coursework towards a Masters in Pedagogy with Emanuel Borok. Ms. Ramirez has been a core member of the Houston Grand Opera and the Houston Ballet Orchestras since 2008, and she also performs regularly with the period instrument ensemble, Mercury as well as the Apollo Chamber Players, with whom she has released several commercially available albums. To further her education, Ms. Ramirez has participated in numerous music festivals throughout the world, including the Aspen Music Festival with Dorothy Delay, the Mozarteum of Salzburg with Carlo Chiarappa, and the Musicorda Festival with James Buswell. 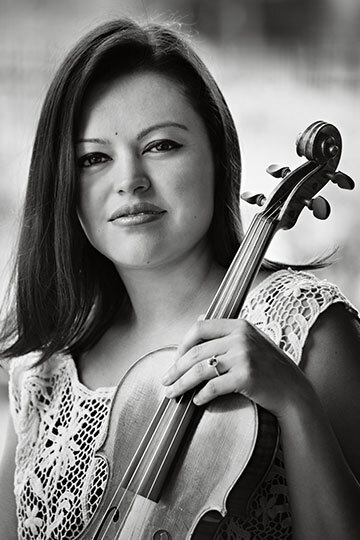 Ms. Ramirez was the winner of the 1998 American String Teachers Association regional competition as well as the Musicorda Concerto Competition. She was awarded the 2002 Mozart Medal for musical achievements and has also appeared as soloist with all the major orchestras in her home country, including the National Symphony and Mineria Symphony, and with the Galveston, Clear Lake, Woodlands, Ludwig and San Antonio Symphonies in the US.